WASHINGTON (CNS) — To end the U.S.-Mexico border crisis, the United States must address the flow of illegal drugs and arms and the harmful economic policies forcing children and families to leave Central America for the U.S., said the chairman of the U.S. bishops’ Committee on International Justice and Peace. 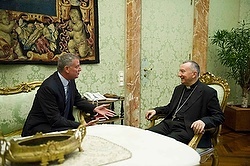 NEW YORK (CNS) — New York Mayor Bill de Blasio said it would be an “extraordinary moment for our city and an extraordinary honor” if Pope Francis visited the Big Apple in September 2015, when the World Meeting of Families takes place in Philadelphia. Richard Matthew Gros, 47, of Fred, died Wednesday, July 23, 2014, at Dogwood Trails, Woodville. He was born on March 5, 1967, in Beaumont, to Rose Mae LaPoint Gros and Robert Lewis Gros. Richard was a United States Army veteran and worked as a salesman and mechanic for Auto Zone. Survivors include his father, Deacon Robert Gros of Kountze; siblings, Rory Gros of Beaumont; Rhonda Baldwin and her husband, Steve, of Kountze; and Roxane Leary and her husband, Mike, of San Leon; and numerous nieces and nephews. Mr. Gros’ arrangements are pending under the direction of Broussard’s, 530 West Monroe, Kountze. WASHINGTON (CNS) — The Obama administration has filed a brief with the 10th U.S. Circuit Court of Appeals in Denver indicating it plans to develop an alternative for Catholic and other religious nonprofit employers to opt out of providing federally mandated contraceptives they object to including in their employee health care coverage.